One of the most insecure forms of communications is email. Email is stored not only on your computer (even if you delete it) but it’s stored on a Web server whether you use a Web mail service or your ISP’s mail service. And by now, there is one thing we all know — if something is stored anywhere on the Web it can be hacked and/or scrutinized. And maybe you don’t write any emails with any personal information in them and therefor you’re not concerned about having them explored by prying eyes. On the other hand maybe you just don’t realize how much private information is store in the emails to/from your account(s). For instance: You signed up for an account somewhere and they send you a welcome letter with your username and/or password. Or you give your password to a family member (it happens). The facts are that even if most of us think we don’t send/receive personal information to/from our email accounts, almost all of us do. And almost every email account, whether you use your ISP’s mail service or a Web mail service like Gmail or Outlook.com all of your email, received, sent and drafts will be archived on a server that stores emails — and there is no way of knowing how long those are stored. When we tried ShazzleMail we were impressed with it’s simple interface. excellent performance and easy set up. But ShazzleMail is more than a functional email client, your email is not stored on their server — whether you send or receive it. The best way to explain it is to let you read the welcome letter ShazzleMail sent me when I first set up a free account. Welcome to ShazzleMail, a patented email application that transfers all communications directly via a SSL encrypted channel to guarantee impenetrable delivery of your content. In other words…your email, your data. No 3rd party access, no stored copies, no data mining. Sending Email: If you send an email from your ShazzleMail account to a recipient who does not currently have ShazzleMail, they will receive an email with a link to a web browser view of the email you sent. No bulky password for them to enter. If your recipient has a ShazzleMail account, they will receive your email in their inbox as they would any other email – except it will remain private and secure. ShazzleMail for Desktop or Laptop: If you would like to use your ShazzleMail account on your PC or Mac computer, click here to go to http://shazzlemail.com/downloads and download our Outlook Plug-In or ShazzleConnect to use with your Windows or Mac email. As a reminder, your new email address is xxxxxxxxxx@shazzlemail.com. If you need any assistance, visit our website at www.shazzle.com and select FAQs or Help. Thanks again and enjoy your privacy… finally! OK to sum it up, if the recipient has ShazzleMail, they’ll be able to open your secure message in the ShazzleMail program. If they don’t, they’ll receive a message with a link to click to read your email securely online. Once they close their browser, the message is gone forever. You retain a copy in your sent folder on your local machine. It’s the only copy and you retain control of it. This would have been our freeware pick this week but for the fact that in order to get a ShazzleMail account you need an Android or Apple device. If you have one you can sign up for a free account then download the free ShazzleMail program for your Widows or Mac computer. In order to use the secure mail feature, you must have a ShazzleMail account. And in case you are wondering – yes once you get a ShazzleMail account and set it up, you can add additional accounts such as Gmail or your ISP account. But keep in mind that accounts other than your ShazzleMail account will not be secure. I did not download yet but did try shazzle email by sending an email to my husband. Went to his computer and there it was. It sounds real good. Will download and if having too much problems will let you know. Thanks for making our emails etc. more secure. Just wanted you to know that I just open up an email from you, today in my spam bin on my Gmail. This is the weekly news letter. Whats happening. This has never happen before. In Gmail, you control your account. If a newsletter gets tossed in the spam folder, highlight it and click NOT SPAM and it will immediately be placed in your inbox and new mail that arrives from the same sender will not be placed in the spam folder. Do I understand correctly? A recipient without Shazzle receives an email with a link to click on. When their browser is closed, the message is gone. If both sender and recipient have Shazzle, the recipient can choose to save or delete the message – the same as any other email program. Additionally, can you “reply”, “forward”, send to multiple recipients, as long as ALL parties Shazzle and are, therefore, in the Shazzle network? No it’s not the same as any other email client. Your ISP or Webmail service retains a copy forever — or for a very long time. Any email you send with your ISP account, Gmail account, Oulook.com, Yahoo Mail, etc. is saved on a server over which you have no control. 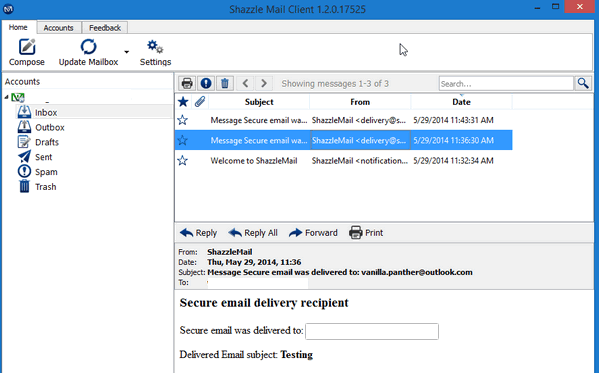 ShazzleMail uses SSL encryption and does not save any email you send with your ShazzleMail account. Of course, there are copies on your computer if you don’t delete and erase them but you control that. Do you think shazzlemail may make an email program or App for an iPad ? I don’t have a desktop or laptop right now but I am really looking for a secure mail program, I have been with AOL for many years and nothing but problems all the time. I have a free account and get my mail via server so I don’t feel secure @ all, I do not have their software on my iPad much too big & lots more headaches. Help????? Thank you guys for all your wonderful helpful things I’ve been a 20+ year subscriber & shared your site with lots of family & friends. Keep up the good work. I would like to see more iPad & iPhone tips & tricks & freeware Apps though!!! I don’t know. That would be a good question to ask Shazzle — perhaps they already make such an app. I don’t have an iPad – I am poor and have a Samsung Galaxy Tab.